Today I thought I would share with you all some of my recent purchases, my very kind Nanna and Great Aunt both gave me some money for Christmas so I have been lucky enough to have a little bit of spare cash to spend on vintage! I’ll start off by saying I’m actually feeling really let down by ebay at the moment, well in the UK at least. I am finding that there are less and less sellers out there offering high quality vintage pieces that are accurately described. 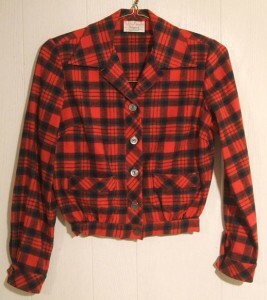 There are a few exceptions, Lestervintage is one such seller. I’ve bought from this seller before and their items are always exactly as described. I also really appreciate how well photographed they are. Another on this list is redappleclothing who again I have bought from in the past. The problem seems to be the sheer volume of incorrect listings out there. I’ve ended up with three paltry eighties copies of 50s dresses lately due to people insisting things are genuine 50s that are not. If you aren’t sure, state it! So yes, this means my vintage buying habbits have swerved overseas and I’ve been buying quite a few bits from America, something I never used to do for fear of a)import charges and b) the items taking an age to arrive. This has surprisingly not been the case and I’ve been really happy with the items I’ve picked up from the US and the price I’ve paid including postage. Here are a few of my recents. 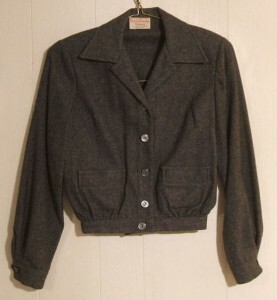 First off these lovely two Bobbi Brooks jackets which I think cost me under £40 for the two and from America. They are in MINT condition and are really versatile too. They both look amazing with jeans, and when the weather warms up a little more I’m sure they will become my springtime failsafes. 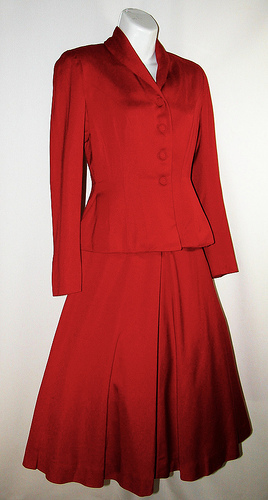 I also bought this SENSATIONAL 40s red suit. I’m sure it only cost $45, it wasn’t expensive at all. The quality of this piece is quite frankly wonderful. It has padded weighted pockets it is beautifully lined in silk throughout and has a really strong metal zipper. The fabric is some sort of Gaberdine and its pretty warm. I think come February I’ll be wearing this number regularly. I’m not normally one for wearing red (I think it looks a bit funny with my skintone) but the colour really looks good on, and even better the suit makes me feel amazing. 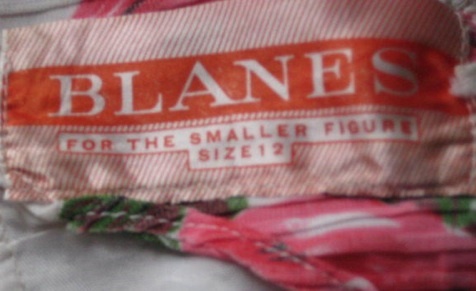 Then onto this lovely little Blanes dress. Another of my obsessive collecting labels. 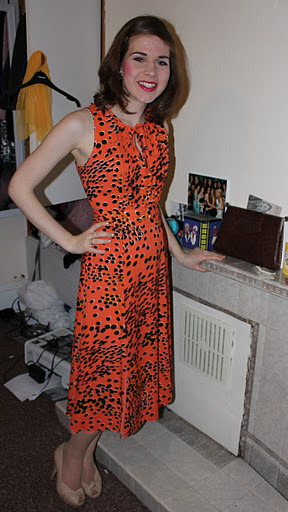 I believe this dress is a very early 60s piece and is a sensational fit too. 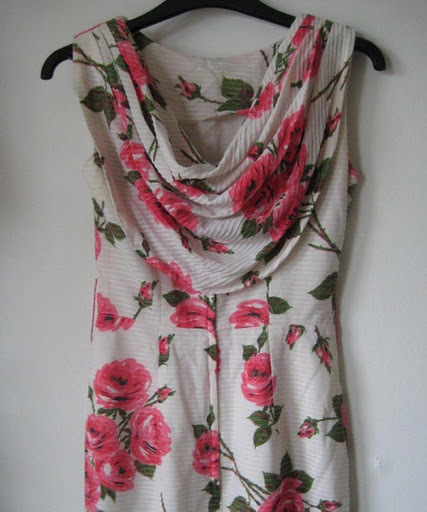 What gives this dress the edge is its lovely cowl draping at the back. I just need to find a belt to go with it now. Hmmmm…. I also wanted to show the fact that I don’t only buy vintage and sometimes the odd new piece creeps into my wardrobe too. I bought this during the week in Leeds as my finishing coursework treat to myself. I love a good bit of zingy orange and it has some little side splits for added interest. I bought it in the Whistles sale and it was reduced from (if memory serves me correctly) £175 to £40. Ace! I just want to apologise for my drag queen worthy make up in these pictures, unfortunately the light in my room is absolutely horrendous and I can never tell until I leave the house quite how heavily I have clarted the make up on!